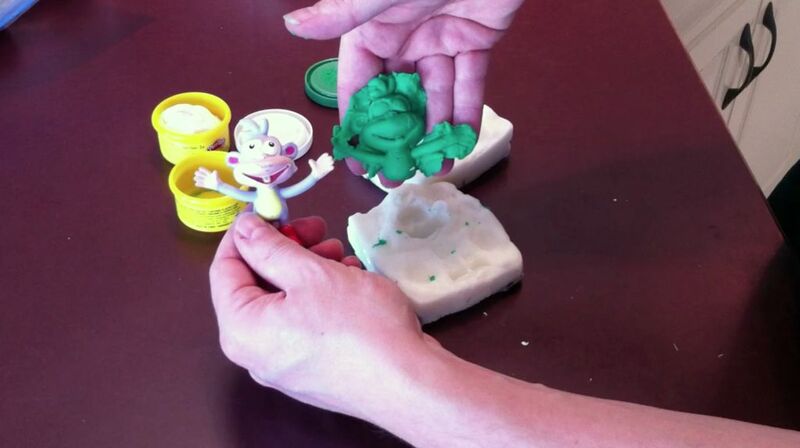 This is a tutorial on how to turn sticky silicon chalking into a pour-able molding compound! Amazing! But there is A LOT of shrinking in the finish mold. This technique is excellent for casting larger items you intend to shrink into doll house MINIATURES! Great for AMAZINGLY detailed doll cookies and making components for jewelry! The final mold will last for years, unlike expensive mold making compounds which go bad after a month or so. If you want to create a mold that does not shrink, you can use the silicon chalk as is. It is very very very sticky. To get it to become usable, you must get a large bowl or bucket of water and squeeze in a TON of dish soap into the water. You dip in gloved hands into the water. The silicon will not stick to the dish soap. If it sticks you need more soap. You can squeeze the entire tube of calking into the water and scoop it out with your hands too, then spread it around your object and into a container, like a yogurt cup. Some times you might get a tiny bubble of water stuck inside the mold. This is pretty annoying later as you can occasional get some water dripping on you, but theis method gives a surprising awesome mold with little to no shrinking. -You can also cast epoxy and urethane, Oogoo, and other kinds of silicone in Oogoo molds. But for them, I would recommend first spraying the Oogoo mold with a spray lacquer to act as a release. This keeps them from sticking to the mold or having them polymerize incompletely which can leave the casting with a sticky surface.